Former Fifa president Joao Havelange has resigned from the International Olympic Committee (IOC) days before an ethics hearing into his conduct. The 95-year-old was facing suspension over his involvement with Fifa's former marketing agency International Sport and Leisure (ISL). The BBC's Panorama claimed in 2010 that Havelange accepted money from ISL for granting lucrative World Cup contracts. 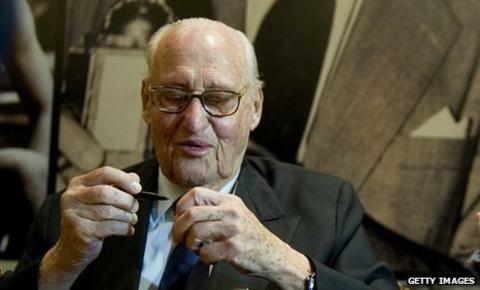 Havelange was the IOC's longest-serving member having joined in 1963. He served as Fifa president between 1974-98 before he was replaced by Sepp Blatter. The IOC released a statement which read: "The IOC confirms that it has received the resignation letter from Mr Joao Havelange as IOC member." Fifa also confirmed Havelange's resignation adding: "Fifa has taken note of Joao Havelange's resignation as IOC member and the fact that the IOC has closed the case accordingly." Two other IOC members, International Association of Athletics Federations president Lamine Diack and Issa Hayatou, president of the Confederation of African Football, will have their cases considered by the IOC on Thursday. With his resignation the ethics case against Havelange is likely to be dropped. Last month Blatter said he expected at least one member of Fifa's current 24-man ruling panel to leave his post because of the ISL kickbacks case. The marketing agency owned the World Cup television rights until it went bankrupt in 2001 with debts of around $300m (£192m). In 2010, Fifa said two senior officials repaid kickbacks then worth $5m (£3.2m) on condition of anonymity. It has since blocked the court in Zug, Switzerland from releasing documents. Panorama named the officials as Havelange and Ricardo Teixeira, a Fifa executive committee member, and Havelange's former son-in-law. Blatter, who is also an IOC member, has asked an external committee to lead an investigation into the collapse of ISL and will publish the dossier on 17 December after his executive committee meets in Tokyo. An as-yet undisclosed outside body will later advise Fifa's high command on what action to take if it finds members guilty of wrongdoing. Havelange competed in the 1936 Olympic Games in Berlin as a swimmer and the 1952 Games in Helsinki in the Brazilian water polo team before he joined the Brazilian Olympic Committee in 1955. He served as president of the Brazilian Sports Confederation from 1958 to 1973 before taking on his presidential role at football's world governing body. Havelange is the first member to resign from the IOC in an ethics case since former vice-president Kim Un-yong of South Korea stepped down in 2005 rather than face expulsion.